Last weekend we had three days off. It was wonderful, but I do have to admit, I’ve been scrambling this week to make up for the day off. Not only did we have three days off, but the days were filled with random events. First, we met a buddy for an early lunch. And we stumbled upon these horses. The kid looks completely befuddled. After lunch, we headed to Little Venice. I had heard they had some type of festival going on and I was curious to see what was happening. As it turned out, they had a ton of boats. More than I have ever seen there. There were food stalls, some rides for the kids, and some stalls for shoppers. We didn’t stay too long since it was quite crowded and the space is a bit limited. But it was fun to see the boats. After Little Venice we popped into a pub Miles and I wandered by a few months ago. I had been meaning to take the Better Half there when the weather improved. The weather wasn’t great last weekend, but good enough for a longer stroll for a pub visit. The pub was okay. Not the cleanest, but the staff was friendly and I enjoyed my half pint. One of the gentlemen at the bar, who hadn’t said a word the entire time we were there, turned to me when everyone in the pub, including the bartenders rushed outside. He said, “Surely they won’t drive by here.” Then he cocked his head. “But the hospital is just down the road.” He got up. 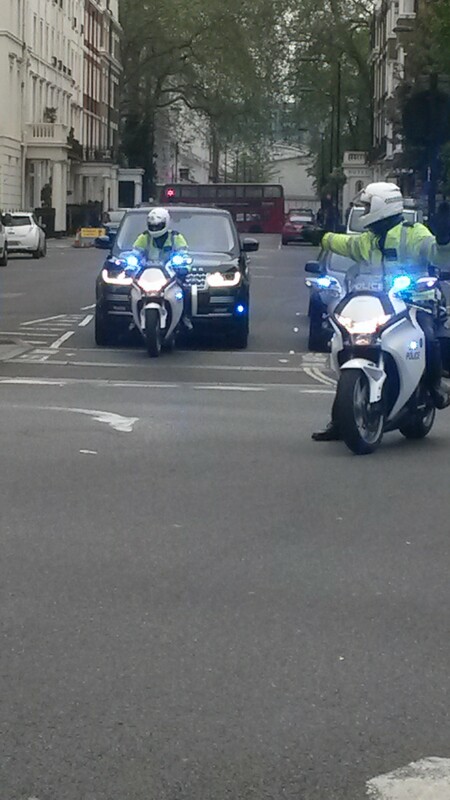 We followed and sure enough, the Royal Baby went by. The photos aren’t great and it happened so fast. We didn’t actually see the baby and it was difficult to see, but William was driving. I think it’s funny that the cop is pointing which direction William needs to turn. On Monday, the weather was pretty decent so I decided to go for a long walk. After three hours of wandering the city, I made my way home through Hyde Park. They had much of it blocked off for a gun salute. I pondered staying, but it was time for me to take Miles out. However, I did see this. I never know what’s going to happen in London. This entry was posted in London and tagged Gun Salute, Hyde Park, Little Venice, Pubs, Royal Baby. Bookmark the permalink. Wow! You always find the coolest things to do and places to see in London. Never a dull moment in your life. Next thing you know Will and Kate will be inviting you over to visit with the new baby, and no, a flask is not an appropriate gift for little Charlotte LOL!! What if the flask has milk in it? Well, I guess that would be ok :). Don’t forget, we have to deal with crappy weather 90 percent of the time. Of course you get tons of snow each winter and then humidity in the summer. Wow! You did have an exciting weekend. To think the little Royal Princess and her parents drove by the pub you were at!! Love all the pictures. We have been busy settling into our place in Spain but we did watch the baby news on the television. It was quite a surprise. 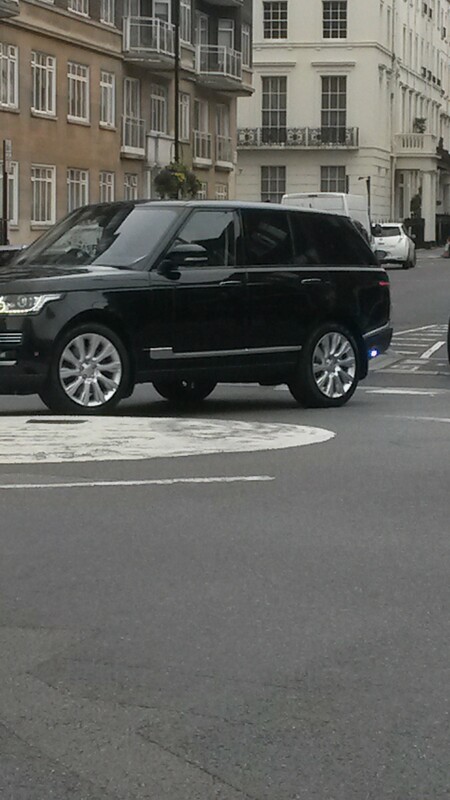 My first royal spotting! I hope the weather is beautiful in Spain. Oh and I bet the food is wonderful. Horses! I love horses, and the pony looking like a dalmatian, how cute is that! Those stairs look like a challenge when you’re sober. I bet many have had trouble with them, especially after a drink or two. Not only were they steep, but they were uneven and not wide enough in some spots. I’m sure many have tumbled. That pony is too cute. He is a cutie! And yes, we had a great weekend. What are those horses hitched to? Can you hire a ride? The boats are great! I’d love to see those. From what I heard, the horses were part of a charity ride and yes, you could hire a ride. By the time we figured it out, they were gone. Not sure what charity they were raising money for. London has been hopping lately with the royal baby, the election, and the end of WWII anniversary. A lot of the pubs have toilets either upstairs or downstairs, and the older ones have stairs like this. I’m getting used to them, but I usually hold on to the hand rail or wall. Wow, great timing, TBM! You make me want to visit London so much. You were in the right place at the right time to see that royal drive-by. I hope Miles wasn’t too scared during the gun salute. I think Reggie would have been. He usually gets nervous during fireworks or thunderstorms. We live far enough away from the park and Miles didn’t hear it at all, which is good. He hates fireworks and to my knowledge, he’s never heard a cannon or gun go off. November is a tough month for him since that’s firework season here. City walks are more difficult to navigate with the streets and crowds and it was really crowded that day since it was a bank holiday and the weather was decent. All good stuff, TBM. Specially the horses, and the prince needing driving directions. I’ve never seen a speckled little horse before. What fun! And the kids do look totally befuddled, so maybe I am not the only one. I don’t know much about equines beyond my donkeys. I love the look on the kid’s face. I hadn’t planned on visiting London this year (it’s been about 4 years since my last visit to the UK), but you have made me start to wonder if it wouldn’t be a good idea to pop over for a few days. Way to step up to the plate to provide company for a friend in the pub. Well done … and quite the sacrifice. I was so startled to hear about the royal baby. I hadn’t even known it was coming. With all the coverage of the first one, it wouldn’t have been possible not to know! Neat that you happened to be in the right place at the right time! Talk about perfect timing. We’d almost left the pub with our friend, but I’m a slow drinker. Finally my slowness pays off. Have missed your pub crawls….Nothing like a royal baby passing by to get the pub crowd excited it seems! I loved that everyone left the pub without a thought to their belongings or anything. You seem to have contracted the “always at the right place at the right time” syndrome! I’m envious! I may have! Hopefully for the good. Wow – what a full 3 days of Adventure!! You had me with the 3 pubs in one day already, but the wee horses and a Princess really put it over the edge. LOL It really does sound like the perfect holiday weekend. It sounds like London is a happening place–at least on holiday weekends. Those stairs do look a bit menacing–when sober! LOL A royal baby is a big to-do, especially when the parents are so well-loved. How exciting to catch a glimpse, something you will always remember. Give Miles a snuggle for me! Looks like you had a lot of fun. So William didn’t know how to get home? lol Just teasing. You had me sold when you mentioned Pub. Never been to London… Outside of Heathrow at least. Keep up the cool travels. You had so much fun there in London. Wish I can visit that place one day.